If a user want to connect with company or any organization outside the company’s network then he use extranet technology. 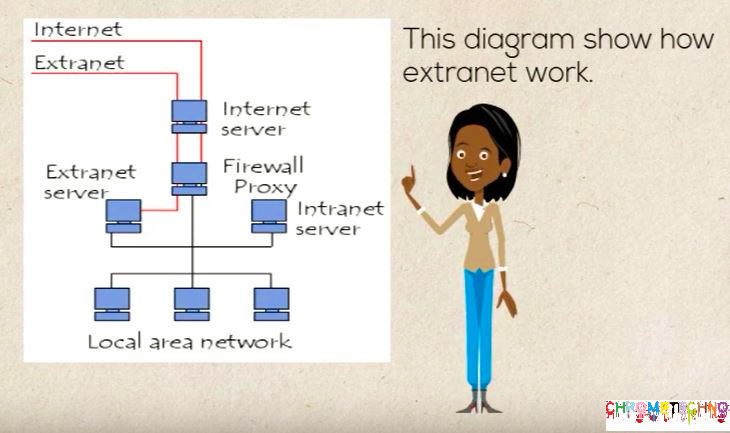 An extranet is a private network that works on Internet protocols, connections, and the public communications system to provide secure information to suppliers, partners, customers, or other businesses. The word “extra” refers to everything that is vital to your business and exists outside of it, such as: vendor, suppliers, customers, and suppliers. It is also a private network that uses Internet technology and the public telecommunications system to securely share some of the company’s information or operations with supplier partners, suppliers, and other companies. The extranet is considered part of the corporate Internet, which is extended to users outside the company. Also referred to as a state of mind that is perceived as an opportunity to do business with other companies and sell products to customers. Get security and privacy through firewall server administration. Create and use VPNs for a virtual private network that tunnels a real public network. 1. Easy to use and access much information. 1. Technical employees are required. 2. Information can be misused by other competitors. 3. Additional firewall security is required. 4. Fraud may be possible. 5. Extranets can be expensive to implement. 2. Integrated offer for automatic tracking, online ordering and inventory management. An extranet is a play a very important part of the intranet. The intranet does not allow organizations and companies to leverage the typical enterprise data available online. For example, an extranet can access the outside environment: customers, suppliers, users, and external stakeholders. Extranet and Internet use the same protocol for sharing data and communication through increased security and privacy. An unauthorized person can access the company’s computer system as a visitor or contractor. The user can unconsciously exchange documents between geographically distributed offices, which can disclose sensitive data when sent over the line. An Authorized Access Professional may deliberately break into Human Resources to obtain confidential salary information. The more possibilities a company has in its firewall, the greater the chance that the wrong people will get into the internal system and into the data. 1. A computer network used primarily in private organizations. 2. The firewall helps to access the Internet. Members within the same organization who access the Internet use Internet protocols, such as HTTP or TCP / IP, which serve as the private Internet. 1. An intranet allows access to external computers or computer networks. 2. The extranet also uses a firewall to protect privacy and protect privacy in public networks.